Lasers are the future of quality dental care, and no one knows this better than Dr. Kenneth Canzoneri. He regularly promotes technological advancements in this field by participating with the World Clinical Laser Institute (WCLI), which is the world’s largest education organization regarding laser dentistry. He has also completed the WCLI’s Mastership requirements, which includes a written exam, several successful clinical cases, and over 60 hours of continuing education. We use Biolase hard and soft tissue lasers in order to perform a wide variety of essential services more precisely, comfortably, and effectively. If you are interested in exploring all of the benefits that this state-of-the-art technology has to offer here in Arcadia, contact our practice today. What is the Difference Between Hard and Soft Tissue Lasers? Soft tissue lasers are primarily utilized when treating the soft, vulnerable tissue of a patient’s oral cavity. This technology can destroy harmful bacteria and even encourage the regeneration of gum tissue. The laser is so comfortable that patients often don’t even require any form of local anesthesia or sedation dentistry for the procedure. Alternatively, hard tissue lasers are used specifically for treatment involving the teeth. Dr. Canzoneri will use this technology to contour or prepare certain teeth for treatment plans, and it’s much more powerful and efficient than traditional tools. 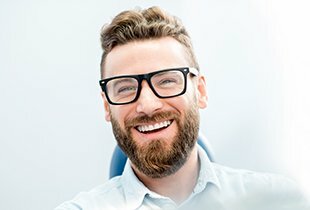 What Kinds of Services are Performed with Laser Dentistry? Biolase lasers are able to treat hard and soft tissue with exceptional preciseness. This means that more of your healthy tooth is preserved and any surrounding areas are safe from accidental harm. Traditional drills can unintentionally create small fractures in the teeth and cause future dental problems for patients. They’re also generally unpleasant, creating vibrations, heat, and the general sensation of a jack-hammer. Thankfully, laser dentistry avoids this possibility. While post-operative symptoms like swelling and bleeding are likely with traditional periodontal therapy, the soft tissue laser’s focused wavelength will sterilize the tissue immediately and minimize these conditions. Your overall recovery from treatment will be accelerated following treatment with laser dentistry when compared to traditional methods. Treatment with a soft or hard tissue laser is highly comfortable, and most patients will be able to receive it as is – no sedative or pain-relieving services required. This means that more procedures can be provided in a single visit, saving valuable time. Because patients won’t often require local anesthesia for dental treatment with laser treatment, they will also be able to avoid the familiar and lingering numbness following their appointment, not to mention any accidental biting of their tongue or lips. 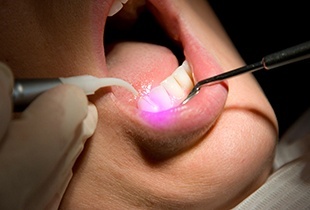 Lasers are more effective at removing cavities before a tooth is filled. 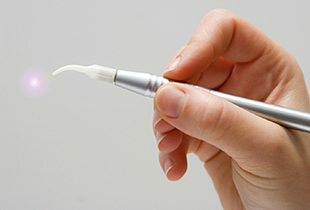 As a result, patients can expect their new filling to have a longer lifespan and less risk of experiencing new bacterial growth (as long as the patient maintains a good oral hygiene routine).